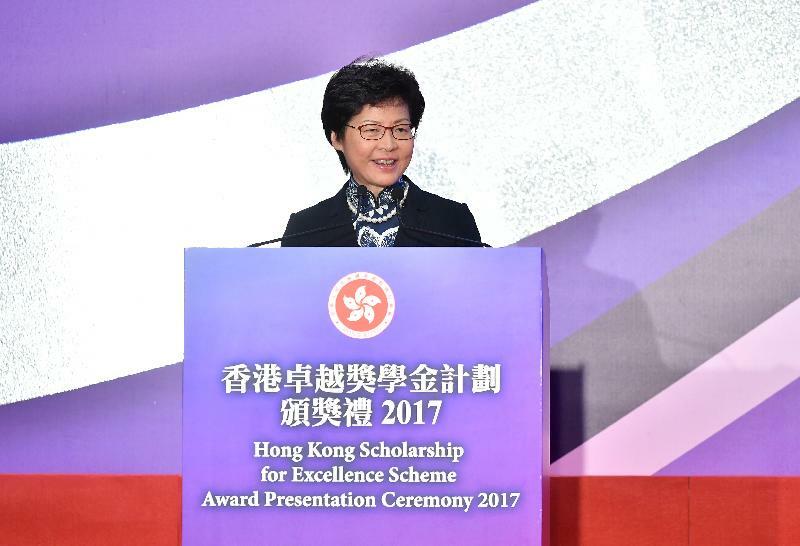 I am delighted to join you today to award a new cohort of scholars under the Hong Kong Scholarship for Excellence Scheme. This is the third annual presentation since the Scheme was first introduced in 2014. 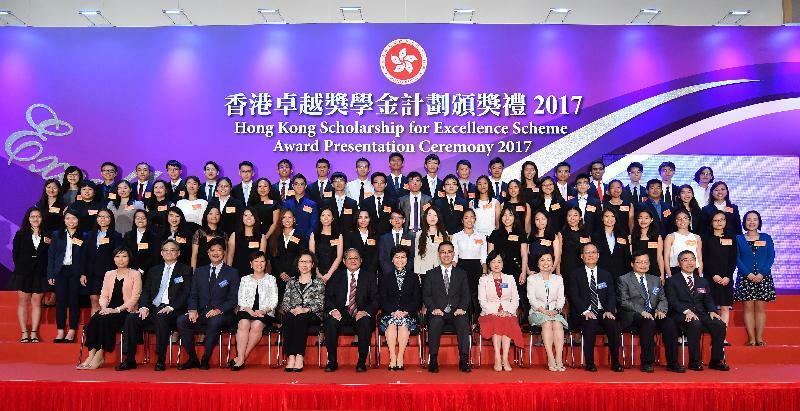 To date, the Scheme has supported more than 180 outstanding students to pursue studies in world-renowned universities outside Hong Kong. While Hong Kong has always prided itself on the efficiency of its world-class infrastructure and unique status as a regional hub for international business and trade, the key to sustaining our success lies with our next generation of professionals, entrepreneurs and community leaders; people who are committed to and capable of serving our city and our country; and people who are eager to innovate, set new directions and make a difference. Grooming such people is exactly the aim of the Hong Kong Scholarship for Excellence Scheme. As graduates return, they bring with them an enhanced set of skills and a deeper understanding of Hong Kong's position in the global context. They will join our rich pool of talents and will drive the development of our economy and our society in the years to come. Indeed, when we first conceived the Scheme, there were worries within the Government whether we were belittling our local universities or brain-draining our own talents. I am pleased to say that we overcame those worries and put the Scheme into place two years ago. Last August, in my then capacity as the Chief Secretary for Administration, I hosted a reception at Victoria House for some of the awardees from the two cohorts. Then in September last year, during my visit to London, I had the pleasure of meeting some of the scholars studying in the United Kingdom. I was most impressed by their passion and determination to succeed in their chosen fields. They also serve as very capable ambassadors for Hong Kong, sharing their knowledge and love of Hong Kong with fellow students on campus. I am sure the new cohort of scholars will be equally impressive. As in previous years, they have gone through a highly competitive process and demonstrated excellence in their academic pursuits as well as leadership qualities. I am glad to learn that the choice of study disciplines echoes the diverse interests and talents of our students. The more conventional courses include science, engineering and arts subjects. Other students have chosen career paths less travelled, including such areas as zoology, nuclear engineering and fashion photography. For the scholars, regardless of the courses you have chosen, I urge all of you to take full advantage of this valuable opportunity to hone your skills and knowledge at some of the very best institutions in the world. Of course, we hope that you graduate with flying colours and return home eager to join us in making Hong Kong an even better place to live and work. My heartfelt appreciation goes to the Chairman, Dr Victor Fung, and Members of the Scheme's Steering Committee, to the members of the interview panels and to the mentors of the scholars. Your hard work and expert advice have helped to make the Scheme a great success. And I am sure that I speak for all the students too, by thanking the parents, teachers and principals for their untiring support and dedication in nurturing our future generation. As a parent myself, I believe that there is a lot of merit in the wise proverb that says "it takes a village to raise a child". Therefore, today, we not only celebrate the achievements of the scholars and wish them well on the next step of their journey, we also celebrate the success of our "village", our community that continues to nurture highly capable future generations. So let's continue to work hard for our next generations, and build a better Hong Kong.